From the book L.A. in the Thirties 1931-1941 by David Gebhard and Harriette Von Breton, 1975. Macy’s Throws it’s Sombrero into the ELA Market! This entry was posted in architecture, Books, East Los by chimatli. Bookmark the permalink. 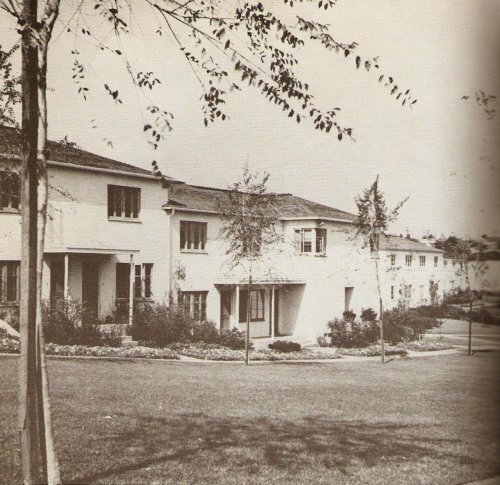 I read how Wyvernwood was part of a large public housing campaign (which is weird as it is private now), and was one of the first developments along with the Pueblo del Rio projects. It was one of the first garden city housing developments and set the stage for other projects. I know these are not projects really but a lot of people think they are still. Public Housing Projects are a trip in it’s self, till this day my honey’s mom still lives in the Pj’s of San Pedro. They have calmed down dramatically over the years and are pretty well kept. Back in the days it was a different story, they where plagued with crime and drugs. It is funny though because for years they been saying they want to tare them down move everybody out and build something am sure more “luxury” on the land. The Rancho San Pedro Housing projects have the best view in San Pedro you see they are right in front of the waterfront, overlooking the gorgeous Vincent Thomas Bridge, and Harbor. Now greedy people are noticing this and want to move into that area. The so called “lows” are where people want to be now. Before it was avoided everyone wanted to live on the “hill”. I do not know what they really plan to do as of now. They did tare down the Wilmington projects and the Harbor City ones a few years back and built affordable housing apartments on the land. That would be better then having condos people can’t afford. A few weeks ago we dropped off a friend at the Pueblo Del Rio housing projects and they kind of looked like the San Pedro ones did 10 years ago. It was interesting. Sorry to get off the the Wyverwood Village thing lol nice picture though. Memories…when I was growing up in Wyvernwood in 1970, it was a great, clean place to live. Green grass, (mostly)clean walls, functional water fountains along the pathways, electricity in the garages. When my parents moved out in 1980, it had deteriorated badly. I drove through Rosalind Ct. a couple of weeks ago and gasped at the conditions of the place. Looks like hell. Trash everywhere and a pungent sewer smell permeate the streets. Sad. I was brought up in Wyvernwood from 1941 thru the early 1950’s. It was the best place to grow up. Everything was green and plenty of places to play. It was for the young professionals just starting out with new families. The Dakota St. Elem. school was just a walk down the street. All of us kids use to go to the Lou Costello foundation for recreation and the swimming pool. For big food shopping we would go to the market on Olympic Blvd. For the small marketing and to buy candies and fun things we would go to La La’s on the corner of 8th St. and Roseland. I went back there in the 70’s and it made me cry. Very little grass, none of the landscaping that use to be there was gone. It looked liked what one would call the projects. I was to frightened to go back again. i lived here from 1977-1989 on Glenn Ave and down the street was my elementary school. It was called Dacotah Street then but i think it was renamed for a teacher who worked there for many years and passed away. i remember saving Koolaid envelops to go swimming at Costello Park in the summer. i remember the trees filled with purple flowers that lines the streets in spring and for christmas i remember Las Posadas when the whole community would get together. Its not that the neighborhood was “better” or “nicer” way back when, nor that it was the “frightening Projects” in the 80’s. In general our childhood memories dont retain the ugliness of society. Im sure little kids who live here now think their hood is pretty rad. On the plus side: at least the Wyvernwood Lane Apartments have staved off dreaded gentrification. Yeah, they renamed the school in honor of a teacher, Mr. Dena. He taught me to draw fred flintsone. We must have been neighbors! just by readin all this make feel like deamm WYVERNWOOD has bein allways the best!! the posadas still runin..we still play soccer in the middle..
Wyvernwood were not projects, but a lot of people thought they were because they’re located right next to some. The projects are the buildings with the great murals. A few years back they tore down the Aliso-Pico Projects next to the 5 fwy. Those were in really bad shape. They were replaced with low to moderate income housing that’s much better. I can’t believe I didn’t see this post when it was first posted! As X-Man says, Wyvernwood has never been public housing—it’s been privately owned from the start—although it is next to Estrada Courts, which are public housing. It’s also built in the style that many public housing projects are: Garden City style. However, we can’t say they’re going to redevelop Wyvernwood yet. This is what the landlord wants, true, because they figure that they if they neglect to maintain the property long enough (and everyone makes remarks like: “What a sad, ugly, scary place that is!”), then people who don’t live in Wyvernwood might support tearing it down. However, Wyvernwood residents are opposed to redevelopment and are fighting it. They know that they would gain nothing from redevelopment because they wouldn’t be able to afford the new rents and/or condo prices. Also, the problems you see at Wyverwood—a historic monument of California on account of its unique, original design—are completely reparable: neglected landscaping, needing new coats of paint, new and better quality floors, etc. As for Pico Aliso public housing community, it was, as X-Man says, badly deteriorated. Rather than fixing them, the city’s housing authority decided to evict the hundreds of families there and build nice, new homes for sale at market prices—so, obviously, not the same people that were originally there. Most of the families that had called that place their home are now gone, scattered throughout LA and Southern California, still poor but now with no housing security. However, a handful of the residents returned and now live in a handful of those new units which were set aside for continued use as public housing. This only happened because these residents decided to organize and create Union de Vecinos. Which then sued and won in court. Ah yes! I also lived on Glen and went to Dakota Street school too!!! This is pretty cool that anyone else would remember the place. Let’s see…I lived there around1967/68 to about 1975/76. I went to The Salvation Army Day Care Center for pre school and kidnergarden. I spent 1st grade (twice) and 2nd grade at Dakota Street School. I also went to day care at Dakota Street School. And summers. (My mom was a single mother by then) They had a pool and in summer I swam there. I played with all the neighborhood kids. Riding bikes, roller skates, skateboards starting at the top of Glen Ave and flying down, what at the time seemed like a big hill! LOL! My favorite was laying down, then rolling myself down the grassy hills! Even though I had asthma and was allergic to grass, I laughed all the way! I remember the alleys and I remember the laundry rooms(ladies with rollers in their hair included! We used to sit on the mail box on the corner in front of David and Dales house. We played so many games and we played day and night, until dinner time. I was born in Wyvernwood in 1960 and lived there until 1980.I lived on aintree lane and went to Dacotah Elm.I had a great time riding my bike ,skateboard, and mini bikes throughout wyvernwood.I still keep in touch with friends I made there.My mon use to make M&M cookies and take them to school for all my classmates.If amyone remembers those cookies write back. Good ol’ Wyvernwood. I used to live at the top of that hill at 2816 Glenn Avenue from 1957 until 1970. I lived in the first house at the top near the garages. We had the biggest yard as it wrapped around from front to back. It was full of trees until the landscaping was redone in the late 1960’s that tore everything out. What a shame. All of us used to call the hill the “Big Front.” We used to ride our bikes down the hill very fast. Across Glenn Avenue was an area called “The Mall” and it had these beautiful white wooden bridges crossing the little creek runing down the length of this great stretch of greenery for half a mile. There was another stretch of green area full of huge everygreen trees we would call Christmas tree lane. I used to go to Dakotah Street school and Costello playground. We used to have annual carnival booths there and buy candy and play games. I had lots of friends there that I do not know where they are now. Friends like Eddie Alvarez, Leo Alzaga, Michael Hammond, Charlie Roni. We did everything together. We used to go underneath the buildings where the pipes were to cool off during the summer. We would also peep into the old ice doors that were used in the old days for the ice man to deliver blocks of ice. We could see underneath people’s sinks at what they had in there. We did our shopping at the old Fine’s grocery store at Olympic Boulevard and Orme Avenue. It was a great two story building. They had a barber shop and a beauty parlor there, too. They used to play the wierdest music in that grocery store, like elevator music from the 1960’s. I used to buy those plastic ice cream inserts that fitted onto the top of a soda bottle there. I would love to place a scoop of vanilla ice cream in the insert, put it on a bottle of root beer, tilt the bottle up, have the root beer pour over the ice cream into my mouth, and have myself a root beer float. I remember one day in the late 1960’s when a huge pit was dug on Glenn Avenue near the intersection of Orme Avenue. It must have been at least 50 feet deep. I saw my friend Charlie fall into it with his bike and I ran and told his mom. Then the fire department came and the news people were there showing it on TV. He was OK afterall. Wyvernwood has a lot of great memoried as I grew up there. I guess it is considered a part of Boyle Heights now. It used to be Angeles Heights as my old phone number had the old ‘AN’ prefix. There was no junior high nor high school there, so we had to take an RTD bus down Soto Street to Gage Junior High in Huntington Park. It went only as far as Slauson and we had to walk the rest of the way. My mom used to work at the huge Sears building on Soto street which was a short walk from Wyvernwood. There used to be a movie theater behind the Wyvernwood garages across the alley that we went to see “The Sound of Music” when it first came out. Yes, a lot of great memories of this place.